UDM Downloads > WEBMARCATION Annotator! 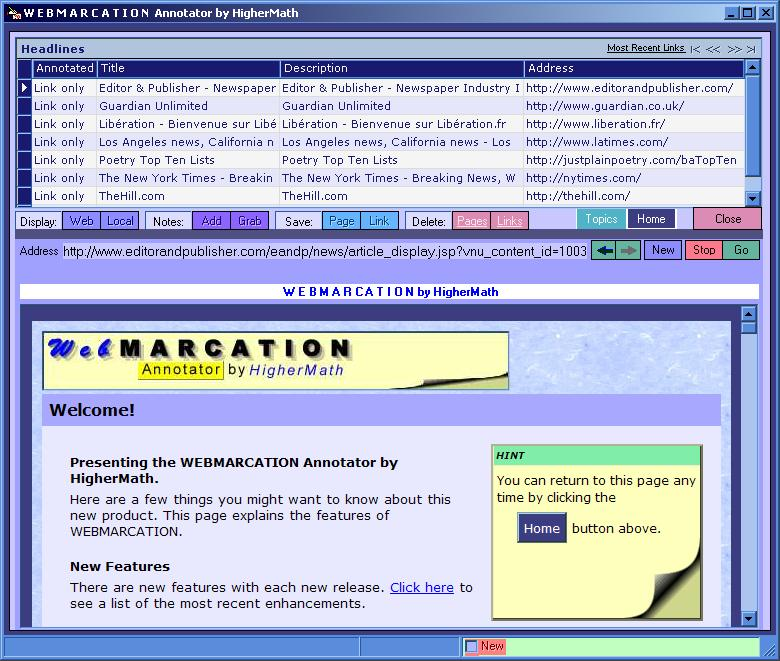 The WEBMARCATION Annotator is a full-featured web browser that allows you to save pages and links to a local cache database. You can add your own notes to saved pages. And you can even highlight passages of text. Saving links for later viewing can be done with a single click. WEBMARCATION's "Grab" feature allows you to grab all the links on a web page or in an RSS feed and view them in a list. You can save any link for later viewing or marked it as "ignored". A few days later you can revisit the grabbed page and refresh the links. The newest links will appear color coded at the top of the list. You can add any number of notes to almost any location on a saved web page. You can move these notes, minimize, edit or delete them. Highlight almost any text passage of a saved web page by selecting the text with our special highlighter cursor. You can change the position of any existing highlight or you can delete it. Instead of opening new windows for each link you want to visit in a web page, WEBMARCATION allows you to save the link for later viewing with a single click. Manage your links and saved pages using our Topics feature. Your currently selected topics list is displayed at the top of the main WEBMARCATION window for easy access and power browsing. You can add the link for the page you are currently visiting to the current topics list by clicking "Save Link" in the toolbar. Or you can save the whole page by clicking "Save Page". You can add descriptions to your saved pages and links in the Topics list, move or copy links to other topics, delete links or pages and create new topics or subtopics. WEBMARCATION is the power browser for serious web surfers, researchers, students or journalists.